Never assume the rod guides will line up correctly. Always check by sighting along the rod while still in the shop! Check also for chipped or hair-line cracks in the line guides. Which species of fish will you target with your new rod? designed and built for different types of fishing. Trout spinning, for example, requires a rod that is thin and flexible enough to cast light lures weighing between 7g and 15g. 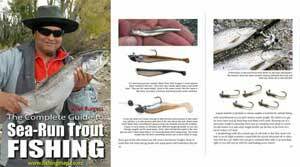 Trout spinning rods are typically between 6 to 7 feet in length. If you were going beach fishing for larger sea fish you would need a much heavier and stronger rod designed to withstand the pressures of casting sinkers weighing up to 160g. Such a heavy casting weight would snap a light trout spinning rod. Typically a surfcasting rod would also be much longer – somewhere between 12 and 15 feet. The longer rod is needed to cast the greater distance required to clear the waves, and also to keep the line above the breakers and so avoid the sinker and hooks being dragged along the beach by the tide. Once a fish is hooked the longer rod actually works against the angler making landing it hard work. In New Zealand Kilwell Sports make a combination pack spin/fly-rod called the Safari. This rod has been designed by Kilwell with sliding reel seat rings so that it can be used with either a fly reel, or an “eggbeater” spinning ‘ reel. This particular rod is a ‘four piece’ and so is ideal for back packers bush walking and tramping in the high country. According to Kilwell the Safari is also good for harling (harling being to troll a fly from a boat). However, these sorts of combination rods are the exception not the rule. They perform adequately but not as well as purpose-built separate rods. Fishing rods, like most other fishing tackle, have fallen sharply in price in recent years. However it is still very much a case of “you get what you pay for!” So the old rule about buying the best you can afford, still applies. It is now possible to buy a reasonable quality spinning rod and reel combo for as little as NZ$39.95. This is so inexpensive it is now almost a disposable item. After all you would probably spend more on petrol for a day’s fishing than the cost of your rod and reel! How much to spend depends on taste, how much use you get from your fishing gear, and how enjoyable it will be to use. Quality rod and reel combos are always a joy to fish with. Good gear will last longer and so prove a better investment in the long run. This is very much the case when buying salmon rods and reels because salmon fishing requires continuous casting and retrieving which will quickly wear out poorly made tackle. In the early 70s split cane fly rods made by Hardy, Sharpes, Sealeys and Aird, were still being sold in New Zealand along solid fiberglass models from Kilwell, Roddy, Jarvis Walker and Monarch. At that time almost all fishing rods were solid glass. Only more expensive “top of the range” rods were hollow fiberglass. The sections of two and three piece rods were joined with metal ferrules. Graphite didn’t come on the scene until around 1980 and then was only used for making very expensive fly rods. Today graphite rods are still the most expensive albeit mush cheaper than the once were. All but the cheapest rods made for young children are now hollow fiberglass. Graphite is far superior to fibreglass when used in a casting rod because the rod diameter is around one-third smaller. This means that there is less air resistance when making a cast. In other words because the rod is slimmer it pushes less air when being cast therefore you get greater tip speed for a given amount of effort compared with fiberglass. Graphite also stores energy more effectively than fibreglass. These factors are very noticeable when used in a 12 foot salmon/surf rod made with a high graphite content. Casting distance is increased considerably even for an inexperienced fisherman. Graphite rods are lighter and yet stronger. This material has almost replaced fibreglass for fly and light spinning rods in all but the budget models. Interestingly graphite is a conductor of electricity and these rods usually have a warning sticker devising against fishing during a lightening storm! Rods designed for use with free­spool reels – which fit on top of the rod – will have more line guides in order to keep the line from touching the rod when it is under load. Spinning rods for use with fixed spool reels need fewer but larger line guides, but should have at least four plus the tip. Generally speaking the more line guides on a rod the better. If it is a toss-up between two very similar rods then take the one with the extra guides. Modern rods have better line guides than those of a decade or so back. Then many rods where made with stainless steel line guides known as “wires.” They worked fine except that the line eventually cut groves in them. The groves in turn caused rapid wear to monofilament fishing lines. Surfcasters in particular had to replace their line guides every season! Almost all of today’s rods have line guides made by incorporating abrasion resistant ceramic rings held in place by a shock absorbing plastic ring in a metal frame. The cheapest of these were the old white porcelain ceramics. These didn’t last long and were used mostly on “entry level” rods. A far superior ceramic material for line guides is aluminium oxide. This material in almost three times harder than porcelain. Aluminium oxide is so hard you can’t wear it with a file and diamonds are needed to polish the surface smooth. Moving up the scale the next best material for line guide rings is silicon nitride. These “N” rings are superior to aluminium oxide in that they are better at dissipating heat. Heat build-up in the guides caused by the run of a big fish can weaken monofilament fishing line eventually causing it to break. The very best line guides are made from silicon carbide. This material is 12 times harder than stainless steel and nearly twice as hard as the older aluminium oxide guides. 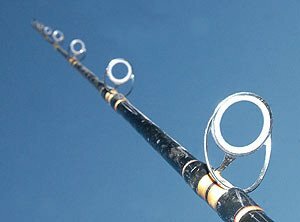 The undisputed world leader in design, development and manufacture of fishing rod line guides is the Fuji Kogyo Company, of Japan . Fuji guides are the best you can get. The name ” Fuji ” is stamped on the frames but you might need a magnifying glass to read it! All of these hard ceramic guides will last the lifetime of the rod, or indeed the owner of it. However they can be broken by rough handling particularly hard knocks such as the rod being dropped on a concrete floor. When purchasing a rod, no matter how illustrious its maker, always check the following: firstly that there are no hairline cracks in the ceramic guides. The easiest way to do this is to pass a six inch long section cut from a pair of woman’s pantyhose through the ring. The material will “catch” on any cracked guides. Finally, sight down the rod to ensure that both the guides and reel seat are all in perfect alignment. It is not unknown for “big name brands” to be atrociously out of alignment. I once purchased a rod from a world leading manufacturer without checking. After all when you pay hundreds of dollars for a rod you expect the line guides to be lined up with the reel seat! The top three guides where about 10 degrees out of alignment and I never actually noticed until a mate pointed out the flawed workmanship! I took the rod back to the store where I had purchased it over a year earlier. They were quite shocked and immediately had it fixed at no charge. Always take the time to check line guide alignment. Rods can get a lot of rough handling which can easily result in chipped or cracked line guides. Pay careful attention to these also when making your purchase. Often a cracked line guide is difficult to spot. Damaged line guides lead to rapid wear of monofilament fishing line.